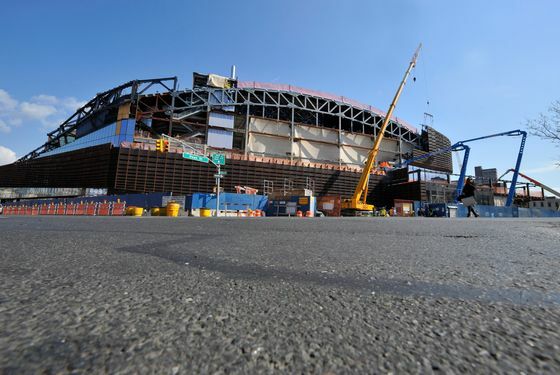 Exactly two months from today — October 2, 2012 — the Barclays Center will host its first sporting event. The place officially opens on September 28, with the first of Jay-Z's eight (eight!) concerts, but smack in between those shows, after the first four and before the second four, the New York Islanders will play the New Jersey Devils in an exhibition game. Now, that game will have a completely ridiculous seating arrangement because the Barclays Center isn't set up for hockey, but no matter: It will be an actual sporting event at the Barclays Center, just two months from today. But sports-wise, it's mostly gonna be the Nets at first. Their home opener is already famously November 1 against the Knicks, but they will be getting comfortable with Brooklyn fast; their first three games, and six of their first eight, will be at the Barclays Center. They're gonna be keeping that place busy. The New York City sports landscape, for better or worse, is going to be changed dramatically two months from today. We're not sure what to expect. But we can't wait.